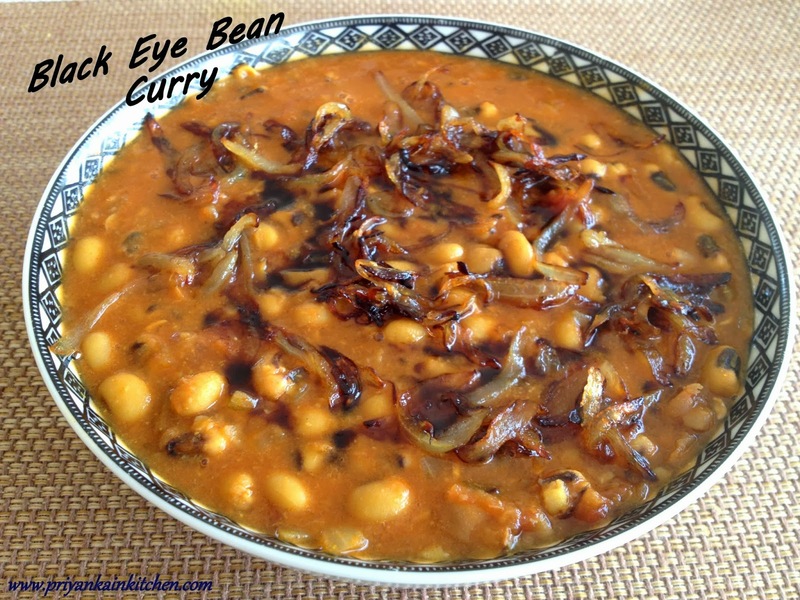 Lobhiya masala is a spicy curry made with black eye beans in onion and tomato gravy. The blend of sweet, sour and hot flavors in this not so common curry, is just perfect to serve with any Indian bread or rice. Pressure cook soaked Black eye beans with enough water and salt on high till one whistle and then on slow for 3 minutes. Turn off the heat and let the pressure release on its own. Heat a pan and oil to it. When hot, add cumin seeds and let them crackle. Add onions and fry them until they turn translucent. Add tomato, ginger, chili and coriander powder. Fry until it starts to leave the edges of the pan. 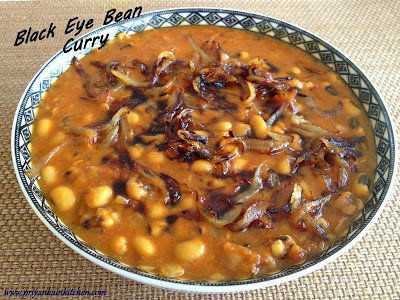 Add boiled black eye beans along with water, garam masala and tamarind chutney (or its substitute). Mix well, crushing few beans to give a uniform consistency to the gravy. Add boiling water. if needed to adjust the consistency. Cook until everything comes to a boil. Serve hot garnished with fried shallots and some more tamarind chutney, if you like. 1 inch of water above the bean level in pressure cooker is generally sufficient to cook this, as this bean doesn't absorb much water.